Mountain Dew (stylized as Mtn Dew in the United States) is a carbonated soft drink brand produced and owned by PepsiCo. The original formula was invented in 1940 by Tennessee beverage bottlers Barney and Ally Hartman and was first marketed in Marion, Virginia; Knoxville, Tennessee and Johnson City, Tennessee with the slogan "Ya-Hoo! Mountain Dew. It'll tickle yore innards." A revised formula was created by Bill Bridgforth in 1958. 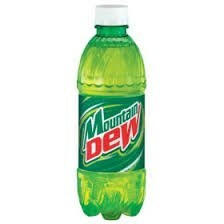 The Mountain Dew brand and production rights were acquired by the Pepsi-Cola company in 1964, at which point distribution expanded more widely across the United States and Canada.